MOO.com Asks Four Top Digital CEOs An Important Question: 'What Tech Can't You Live Without? MOO.com wants to find out what technology we simply cannot live without. With new tech coming at us all the time, the list seems to grow longer each year. New iterations of phones come, yes you iPhone X, and the must-have devices increase, including things you never realized you needed, and get increasingly expensive too. But there are must-haves and luxuries for our daily lives, and then there's technology that is now so ingrained in our daily lives that we simply cannot live or function without it. Be it for our daily business needs, or for our social lives. In this video MOO.com speaks with four top digital CEOs—the co-founder of Weebly and the inventor of the Cronut® among them—to find out what piece of tech they just could never have out of their grasp. As MOO discovers, it's something that is completely wireless, never runs low on battery, and is super portable. So what is it? And why haven't i got one? Well, it's a business card. Yes, that simple rectangular piece of paper that details who you are and can potentially grow your business simply by passing it to someone. Created in the style of the revelatory, hallowed tech demos typical of Apple and iPhones, business stationary company MOO have created a spoof advert for business cards as though they were the iPhone X. And so the tongue in cheek video presents MOO business cards in the vernacular of the tech industry and Silicon Valley. Which means information is "stored" not printed on the card, while it "connects" to your wallet as a "paired device" and erasing your data is as simple as putting the card in a blender. It's the most simple tech ever. In a world where technology is utilized in nearly everything we do, it's a reminder from MOO that sometimes the low tech option can be just as functional. And as the video's slogan makes reference to—and as was recently seen with the huge backlash against startup Bodega—not everything needs to be disrupted or improved. Some things are fine just as they are. So if you haven't got one yet, got get one. They come in lots of different colors. 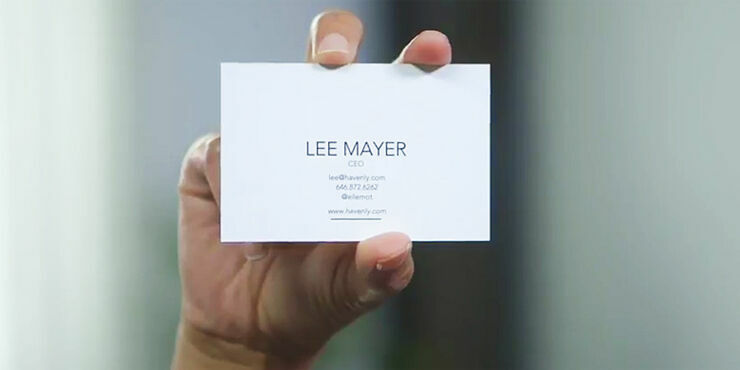 Check out this super-lightweight tech device (aka the business card) from MOO.com here.